A century is a long time – one hundred years. That’s how old the Peterson farm is. What was once boggy, stump-strewn land is now a thriving dairy farm, worked on and cultivated by five generations of the Peterson family in Wisconsin. Writing in the voice of her husband, Gary, Cris offers glimpses of life on the farm they have worked together for more than twenty-five years. Alvis Upitis captures the simple beauty of a corn stalk bending in the sun and the power of a forage chopper pulled behind the tractor. 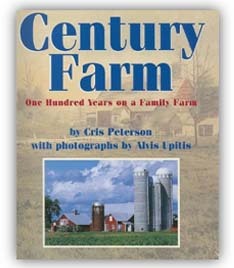 This talented author-photographer team has created a unique portrait of life over the past hundred years on an American family farm.